As a rule of thumb, you want to have six or more recommendation letters. In most cases, you are going to draft the recommendation letters before sending them out to your referees for signatures. For this reason, you want each recommendation letter to focus on one or two of your major contributions. Two components will cost most of your I-140 petition preparation time: the petition letter and the recommendation letters. The I-140 petition letter needs to be compelling. This letter will summarize and highlight your credentials and achievements. One also needs to gather strong supporting recommendation letters for the I-140 petition. It is common for an applicant to have six to ten recommendation letters. It can take you a few months to collect all recommendation letters from your referees. Green card application is a two-step process: the I-140 permanent residency petition and the I-485 adjustment of status application. The I-140 petition is the key step. 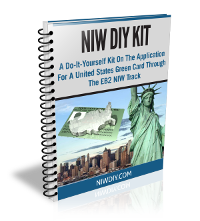 Yes, you can submit your EB1A and NIW application at the same time. There is no restriction on how many petitions one can submit at the same time. Actually, to increase your success possibility, you are encouraged to submit multiple applications. For the employment-based application, there are two categories where one can apply for a green card by oneself. These two categories are “EB1A” (Alien Worker with Extraordinary Ability) and “EB2-NIW” (National Interest Waiver). Here “EB” stands for “Employment Based”. All other employment-based categories require sponsorship from the applicant’s employer. This entry was posted in Uncategorized on December 15, 2014 by wp_lubw.